Doro Niang, GeoIntern Scholar, reports on his work in the Canary Islands to build resilience in the face of climate change. GeoIntern is a summer training programme run by British company GeoTenerife in association with INVOLCAN, the Canary Island Volcanology Institute. One of their recent scholars was Doro Niang from Senegal and we caught up with him to see how he got on. “The main objective of the GeoTenerife programme I participated in, Environmental Monitoring, is to promote green energy with the development of biogas, so that public and private structures can take ownership, allowing better management of solid waste by minimising air pollution. “From the various studies we undertook, we gained a better understanding of methane emissions in landfills while capturing this gas for energy conversion through biogas." Tenerife, the largest Canary Island sitting on the African tectonic plate, is committed to promoting sustainability. The local government's plan to fight against climate change has been adopted by local authorities through the Tenerife 2030 initiative. "Greenhouse gases, beyond their role in global warming, have a negative impact on groundwater and the quality of soil in the landfill we researched," said Doro. “The use of new research tools for the study of greenhouse gas emissions and the promotion of green energy are priority areas for the Canary Island Volcanology Institute (INVOLCAN) and the Tenerife Renewable Energy Institute (ITER) of Tenerife in the Canary Islands. This is done in collaboration with GeoTenerife as part of their GeoIntern programme which provides training for young scientists during the summer for the development of their skills. “Methane (CH4), the second largest anthropogenic greenhouse gas after carbon dioxide (CO2) and accounts for over one-third of anthropogenic climate forcing. Although methane remains in the atmosphere for a shorter period of time than CO2 and is emitted in smaller amounts, its "global warming potential" is 20 to 25 times higher than that of CO2. “The main objective of this study is the promotion of green energy with the development of biogas so that public and private structures can take ownership but also allow better management of solid waste by minimizing air pollution. “As part of the research methodology, field and laboratory work is carried out. A spatio-temporal distribution of the study area is undertaken with 444 landfill gas collection points that are formed during the decomposition of organic matter in landfill sites. “The collection, processing and analysis of data is carried out by powerful tools and equipment such as the non-dispersive infrared sensor (NDIR - a simple spectroscopic sensor often used as a gas detector); micro chromatography MGC 4900 and sequential Gaussian Simulations. “The results of the various studies are convincing, thus enabling a better understanding of methane emissions in landfills and capturing this gas for energy conversion in the context of biogas. 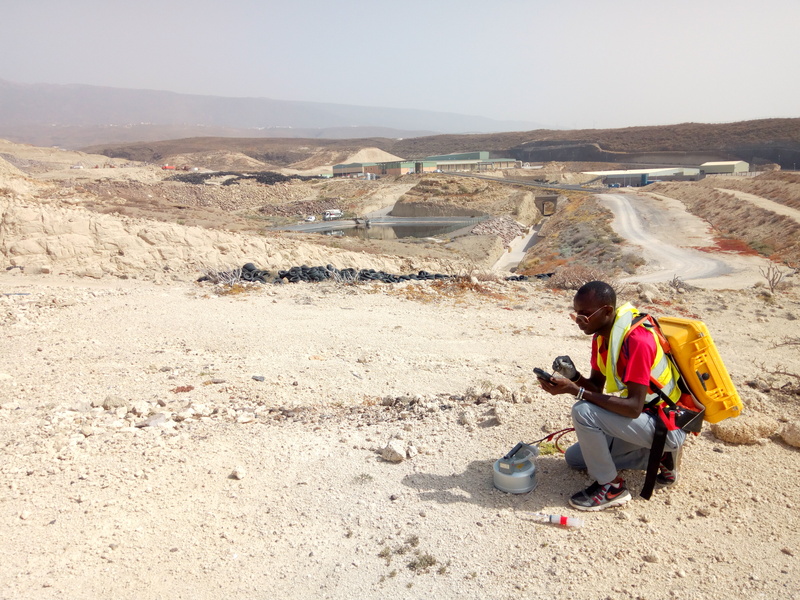 “I was able to travel to Tenerife from Senegal for a month and take part in the whole programme thanks to the GeoTenerife's GeoIntern scholarship initiative. I acquired a range of new skills and made many new contacts for my future in science. I am grateful for the opportunity and will keep in touch with my new colleagues for years to come." Doro Niang is an Environmental Geologist and Geotechnician. He is a PhD student and President of the Association of Young Geologists and Environmentalists of Senegal. Students with a passion for the sciences – in particular, earth sciences such as geology, geography, geophysics or chemistry – need not look no further than GeoTenerife, a British travel company which specialises in the organisation of undergraduate and post-graduate summer placements each summer. Now in its sixth year, the GeoIntern programme encompasses a complete package for science students keen to acquire transferable skills and hands on knowledge. As part of the GeoIntern programmes, students receive mentoring from scientists at the well-respected Canarian Volcanology Institute, with a minimum of 120 direct contact hours over the four weeks. On top of this, students also receive science communication training, ensuring the next generation of scientists can present their knowledge and findings to both scientific and non-scientific audiences. This will help with both personal development and the impact these students can have on society. As part of the GeoIntern Programme, students can apply for scholarships which cover the full course fees (which covers accommodation, all local daily transfers, teaching and excursions) as well as a €500 stipend. Scholarships are only available for students who would not otherwise be able undertake this opportunity. Full details about the GeoIntern scholarships can be found here: http://geotenerife.com/scholarships/. To find out more about the GeoIntern programme please visit the GeoTenerife website here: http://geotenerife.com/summer-programme-info/. Additional high-resolution images available upon request. For further information about GeoTenerife please contact Josh Balmer at josh@famouspublicity.com or Steven Hanlon at steven@famouspublicity.com or call the office on 0333 344 2341. GeoTenerife is a UK company with a fully-owned subsidiary in the Canary Islands that organises tailor-made field trips and courses for universities, schools and colleges. GeoIntern is a summer programme run by GeoTenerife in association with the Canary Island Volcanology Institute. GeoTenerife also organises field courses for hydrology, marine biology, botany and science communication. GeoTenerife is committed to developing sustainable tourism, and works closely with local experts, institutions and facilities. ABTA member Y6373. This press release was distributed by ResponseSource Press Release Wire on behalf of GeoTenerife in the following categories: Children & Teenagers, Men's Interest, Entertainment & Arts, Leisure & Hobbies, Women's Interest & Beauty, Environment & Nature, Business & Finance, Travel, Education & Human Resources, Media & Marketing, Transport & Logistics, for more information visit https://pressreleasewire.responsesource.com/about.